Can you imagine accessing hundreds of theme-based television channels free of charge? 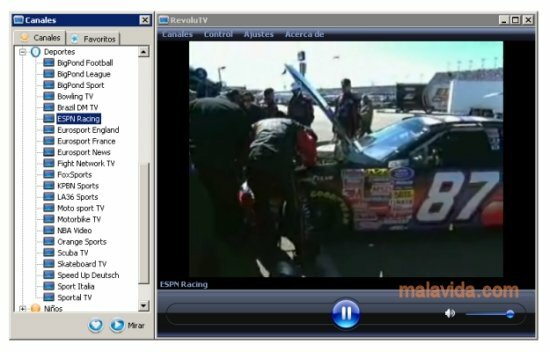 The answer is RevoluTV, an application that will allow you to see television through the Internet comfortably on your computer. RevoluTV offers, from an intuitive interface, access to a vast amount of channels organized by categories depending of their contents: News, Variety Shows, Lifestyles, Music, Shopping, Films, Children, Sports, Religion, etc... It is so simple to use as doing double click on the channel that you want to watch. If it is available, in a few seconds you will be able to enjoy its contents. Among the options that the application includes, the most important ones are: the possibility to configure your own list with your favorite channels, change the size of the viewing window, pause the playback and mute the sound. And the best thing is that you can enjoy all the latter without having to install any TV tuner cards, because RevoluTV uses streaming technology to share all the Internet based broadcasts.